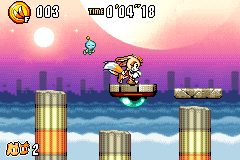 Chaos Angel is the seventh zone in Sonic Advance 3 and the last full zone of the game, taking place in ruins in the sky rather than a space station like Cosmic Angel Zone or Egg Utopia, the seventh zones of the previous two Sonic Advance games. In appearance, it is very similar to a temple or an altar with indoor and outdoor areas. In the background outside, a moon and a large thunder head can be seen. Indoors, the walls are green with ancient writings on them, and are lit by lanterns. Acts 1 and 2 are structured in that the player will go inside the ruins and overcome hazards such as falling boulders and crushing walls, and gimmicks such as spinning platforms that move when the player runs on them, much like the bolts from Metropolis Zone. The see-saws from Route 99 and the crouching catapult from Twinkle Snow return, along with a sideways variant of the latter that the player must push. The outdoor areas are generally more sparse in terrain than the indoor areas and thus are rife with Sonic Advance 3's infamous bottomless pits. Both Acts are very long, lasting over 4-5 minutes. The 3rd act of this zone takes place almost entirely outdoors on floating platforms that the player must ride across a colossal bottomless pit. Falling off isn't the only danger, as there are many spike traps, boulders and Stingers that can potentially knock the player off the platform to their doom, and a section where the platform moves up and the player must avoid being crushed into the ceilings. Apparently, Chaos Angel is located on Angel Island, as it is graphically similar to the next level, Altar Emerald, which has the shrine of the Master Emerald in the background. Ape - A monkey robot similar to a Coconuts. Swings from pillars and drops bombs. Marrun - An armadillo robot that rolls when approached and must be attacked when it's not rolling. Similar to a Dango. Muugaden - A badnik with spikes pointing out of its sides that flies back and forth. Spina - The familiar bat-like badnik that hovers in place, spinning its blades. Stinger - A Sonic Advance series mainstay. Flies in the air and fires bullets from its stinger. This page was last edited on 3 March 2018, at 19:12.